The Cunningham Invitational track meet was held Friday, April 20 in Louisiana. The Van-Far Indians captured first place with 187 points followed by Bowling Green Bobcats with 141 points. Louisiana Bulldogs placed sixth with 24 points and Silex Owls were seventh. The Bowling Green Lady Bobcats took first with 187 points; Louisiana Lady Bulldogs scored 70 points for fourth place; Van-Far Lady Indians were fifth with 56 points and the Silex Lady Owls finished in eighth place. 100 Meter – Jacob Garner, VFHS, 2nd, 11.85; Verlyn Johnson, VFHS, 3rd, 11.92; Brandon Chatman, LHS, 9th, 12.77; Timothy Elder, LHS, 10th, 12.87; Colton Johnstone, SHS, 14th, 15.11. 110 Meter Hurdles – Josh Hodde, VFHS, 1st, 16.02; Austin Orf, BGHS, 3rd, 17.52; Chad Bowen, LHS, 4th, 18.24. 1600 Meter – Lathyn McMorris, VFHS, 3rd, 5:09.99; Samuel Hazel, VFHS, 4th, 5:13.03; Grayson Rubino, LHS, 9th, 6:33.02; Michael Powers, LHS, 11th, 6:47.94. 200 Meter – Verlyn Johnson, VFHS, 1st, 23.59; Dalton Oberhaus, LHS, 2nd, 23.69; Dillion Minor, VFHS, 3rd, 24.16; Matt Kay, BGHS, 4th, 24.49; Cale Shotton, BGHS, 5th, 25.23; Chancey Runyon, LHS, 7th, 25.57; Colton Johnstone, SHS, 12th, 31.02; Stephen Gissenaas, SHS, 13th, 31.55. 300 Meter Hurdles – Trevor Crider, VFHS, 1st, 42.78; Josh Hodde, VFHS, 2nd, 42.98; Noah Pafford, BGHS, 4th, 46.01; Austin Orf, BGHS, 5th, 47.40; Chad Bowen, LHS, 6th, 47.42; Stephen Gissenaas, SHS, 55.65. 3200 Meter – Lathyn McMorris, VFHS, 11:06.20; Tyler Robinson, VFHS, 3rd, 11:17.15; Evan Meyer, BGHS, 4th, 11:35.27; Cody Wilkinson, BGHS, 7th, 12:28.65. 400 Meter – Parker Wallace, VFHS, 1st, 51.68; Dillion Minor, VFHS, 4th, 55.39; Javan Moore, BGHS, 5th, 56.61; Christian Medina, LHS, 11th, 1:00.74; Matthew Capstick, LHS, 13th, 1:07.60. 800 Meter – Blaine Hunt, BGHS, 2:06.58; Lathyn McMorris, VFHS, 2nd, 2:09.01; Hunter Hobbs, LHS, 4th, 2:16.35; Samuel Hazel, VFHS, 6th, 2:18.91; Andrew Bowen, VGHS, 10th, 2:24.30; Tylerr Pedersen, LHS, 12th, 2:38.66. Discus – Ben Walker, BGHS, 2nd, 127-03; Kyle Ebers, VFHS, 3rd, 121003; Dillon Burbridge, BGHS, 7th, 99-04; Dalton Gloe, LHS, 11th, 87-01; Jesse Calvert, LHS, 13th, 80-07; Madimus Roed, VFHS, 14th, 77-03; Colton Johnstone, SHS, 17th, 61-10. High Jump – Austin Orf, BGHS, 1st, 6-02; Corey Bell, BGHS, 3rd, 5-06; Brennan Wheeler, VFHS, 4th, 5-04; Brogan Wheeler, VFHS, 5th, 5-02. Javelin – Lathyn McMorris, VFHS, 1st, 126-04; Blake Crider, VFHS, 3rd, 112-03; Ben Walker, VFHS, 4th, 109-09; Dalton Oberhaus, LHS, 7th, 97-03; Phillip Byram, BGHS, 8th, 93-10. Long Jump – Josh Hodde, VFHS, 1st, 19-08; Corey Bell, BGHS, 4th, 18-03; Kyle Horner, BGHS, 5th, 18; Brogan Wheeler, VFHS, 8th, 16-06; Stephen Gissenaas, SHS, 10th, 14-02. Pole Vault – Kyle Horner, BGHS, 2nd, 12; Jacob Garner, VFHS, 4th, 10; LaTrell Wright, VFHS, 5th, 8-06; Tyler Pedersen, LHS, 5th, 8-06; Timothy Elder, LHS, 7th, 7. Shot Put – Dillon Burbridge, BGHS, 3rd, 39-08; Phillip Byram, BGHS, 4th, 38-04; Alex Flowers, VFHS, 5th, 37-10.50; Dalton Gloe, LHS, 7th, 33-01.50; Jesse Calvert, LHS, 13th, 29-04. Triple Jump – Corey Bell, BGHS, 1st, 39-03.50; Kyle Horner, BGHS, 4th, 36-07; Brennan Wheeler, VFHS, 36-01.50; LaTrell Wright, VFHS, 6th, 35. 4×400 Relay – VFHS, 2nd, 3:33.89 – Parker Wallace, Brennan Wheeler, Brogan Wheeler, Trevor Crider; BGHS, 3rd, 3:47.33 – Avery Mudd, Blaine Hunt, lane Parker, Noah Pafford; LHS, 5th, 4:03.61 – Christian Medina, Hunter Hobbs, Chancey Runyon, Dalton Oberhaus. 4×800 Meter Relay – BGHS, 1st, 8:57.83 – Avery Mudd, Blaine Hunt, Max Brandenburger, Noah Pafford; VFHS, 3rd, 9:24.56 – Morgan Slatten, Tyler Robinson, Cayden Caldwell, Samuel Hazel; LHS, 5th, 10:06.22 – Christian Medina, Hunter Hobbs, Tyler Pedersen, Grayson Rubino. 4×100 Meter Relay – VFHS, 1st, 45.37 – Jacob Garner, Verlyn Johnson, Parker Wallace, Trevor Crider; BGHS, 2nd, 46.55 – Lane Parker, Cale Shotton, Kyle Horner, Matt Kay; LHS, 6th, 52.63 – Chancey Runyon, Brandon Chatman, Ryan Murray, Jacob Gray. 4×200 Meter Relay – VFHS, 1st, 1:34.11 – Jacob Garner, Verlyn Johnson, Parker Wallace, Trevor Crider; BGHS, 2nd, 1:38.60 – Javan Moore, Hunter Smith, Austin Callahan, Cale Shotton; LHS, 6th, 1:46.28 – Chancey Runyon, Brandon Chatman, Timothy Elder, Ryan Murray. 100 Meter – Saige Mayfield, BGHS, 1st, 13.75; Cheyanne Talley, BGHS, 4th, 14.20; Chloee Kinion, SHS, 6th, 14.59; Hanna Blackmore, LHS, 8th, 14.91; Taylor Brown, LHS, 11th, 15.72; Colby Walton, VFHS, 12th, 16.18; Sharon Baur, VFHS, 13th, 17.12. 100 Meter Hurdles – Makayla McAfee, VFHS, 3rd, 18.32; Kamara Combs, LHS, 4th, 18.41; Kaya Rushin, BGHS, 5th, 18.68; Jaidyn Wommack, LHS, 9th, 20.52. 1600 Meter – Kate Klott, BGHS, 1st, 6:03.35; Jayle Jennings, VFHS, 4th, 6:21.86; Nichole Bruni, BGHS, 5th, 6:30.27. 200 meter – Hannah Kroencke, BGHS, 3rd, 28.56; Kinley Charlton, BGHS, 4th, 29.21; Faith Rule, LHS, 5th, 29.28; Emma Inglis, LHS, 7th, 30.62; Carleigh Phillips, VFHS, 10th, 32.89; Tessa Boles, SHS, 12th, 36.02. 300 Meter Hurdles – Vanessa Davis, BGHS, 2nd, 53.15; Kamara Combs, LHS, 3rd, 54.11; Makayla McAfee, VFHS, 5th, 54.79; Kaya Rushin, BGHS, 6th, 55.29; Grace Hudson, SHS, 9th, 56.70; Cecelia Hathaway, LHS, 11th, 59.88. 3200 Meter – Sylvia Wagner, BGHS, 1st, 12:55.94; Madelyn McAfee, VFHS, 2nd, 13:45.92; Taylor Blair, BGHS, 3rd, 14:13.71. 400 Meter – Lathyn McMorris, VFHS, 2nd, 11:06.20; Tyler Robinson, VFHS, 3rd, 11:17.15; Evan Meyer, BGHS, 4th, 11:35.27; Cody Wilkinson, BGHS, 7th, 12:29.65. 400 Meter – Quinn Grote, BGHS, 2nd, 1:03.40; Madeline Perry, BGHS, 8th, 1:12.19; Madison Bradley, LHS, 9th, 1:13.44; Alex Connaway, VFHS, 10th, 1:13.66; Aubrey Bunge, VFHS, 11th, 1:14.90; Jamie Sencenbaugh, LHS, 13th, 1:16.77. 800 Meter – Kate Klott, BGHS, 1st, 2:36.42; Camryn Grote, BGHS, 2nd, 2:44.32; Taryn Adam, VFHS, 5th, 2:52.51; Julianna Martinez, VFHS, 8th, 2: 55.25; Chloee Kinion, SHS, 12th, 3:27.56. Discus – Katelyn Charlton, BGHS, 2nd, 114-11; Jordan Garner, VFHS, 3rd, 97.09; Haylee Chandler, BGHS, 4th, 96-07; Loni Watts, LHS, 5th, 88-10; Krista Baker, SHS, 11th, 67-11; Jaidyn Wommack, LHS, 13th, 51. High Jump – Raelee Burse, LHS, 1st, 4-10; Jaylen Early, BGHS, 1st, 4-10; Julianna Martinez, VFHS, 4-04. Javelin – Jordan Garner, VFHS, 1st, 96-06; Katelynn Charlton, BGHS, 2nd, 96-03; Madison Schroeder, BGHS, 3rd, 94-05; Kayla Lindsay, LHS, 4th, 92; Jamie Sencenbaugh, LHS, 7th, 73-06; Katie Elzea, VFHS, 11th, 36-01. Long Jump – Kaya Rushin, BGHS, 2nd, 13-05; Taylee Beaty, BGHS, 5th, 12-04; Chloee Kinion, SHS, 6th, 12-03.50; Colby Walton, VFHS, 8th, 11-11; Madison Bradley, LHS, 10th, 11; Carleigh Phillips, VFHS, 11th, 10-09.50. Pole Vault – Faith Rule, LHS, 1st, 8-06; Janel Lindsay, LHS, 1st, 8-06. Shot Put – Katelyn Charlton, BGHS, 2nd, 33-08; Loni Watts, LHS, 3rd, 32-06.50; Victoria Meier, BGHS, 6th, 28-00.50; Emily Weatherford, SHS, 10th, 25-01.50; Kayla Lindsay, LHS, 11th, 24-00.50; Cheyenne Martin, VFHS, 13th, 20-05.50. Triple Jump – Kaya Rushin, VFHS, 2nd, 31-07; Alivia Graddy, VFHS, 4th, 29-11; Raelee Burse, LHS, 5th, 29-09; Vanessa Davis, BGHS, 6th, 29-00.50; Cecelia Hathaway, LHS, 8th, 23-06.50. 4×400 Meter Relay – BGHS, 2nd, 4:25.32 – Quinn Grote, Hannah Kroencke, Kate Klott, Camryn Grote; LHS, 4th, 5:23.31 – Madison Bradley, Haylee Miller, Cecilia Hathaway, Hannah Blackmore. 4×800 Meter Relay – BGHS, 1st, 10:59.15 – Quinn Grote, Camryn Grote, Sylvia Wagner, Taylor Blair; VFHS, 2nd, 12:00.30 – Jayle Jennings, Taryn Adam, Aubrey Bunge, Alex Connaway. 4×100 Meter Relay – BGHS, 2nd, 54.37 – Cheyanne Talley, Saige Mayfield, Kinley Charlton, Vanessa Davis; LHS, 3rd, 56.47 – Kayla Lindsay, Raelee Burse, Faith Rule, Janel Lindsay; VFHS, 5th, 59.18 – Alivia Graddy, Shyonna Martin, Jordan Garner, Madalyn Swafford. 4×200 Meter Relay – BGHS, 1st, 1:54.22 – Hannah Kroencke, Vanessa Davis, Saige Mayfield, Kinley Charlton; LHS, 3rd, 1:55.38 – Faith Rule, Raelee Burse, Emma Inglis, Janel Lindsay; VFHS, 5th, 2:04.65 – Alivia Graddy, Katie Elzea, Julianna Martinez, Madalyn Swafford. The Bowling Green Bobcat track team took first place in the Montgomery County Invitational on Tuesday, April 17 with a score of 117.5. Clopton placed 11th with a score of 18.5; Louisiana was 14th scoring 12 and Silex was 16th with 1 point. The Lady Cats scored 132 points for first place. Louisiana Bulldogs placed 10th with 24.5 points; Clopton had 5 points for 15th place and Silex was 18th with 0 points. High Jump – Austin Orf, BGHS, 2nd, 6; Cory Bell, BGHS, 5th, 5-08; Donovan Denslow, CHS, 7th, 5-02. Pole Vault – Kyle Horner, BGHS, 2nd, 12; Joshua Korte, BGHS, 8th, 9. Long Jump – Kyle Horner, BGHS, 3rd, 18-10.75; Colton Riley, SHS, 8th, 17-04.75; Cory Bell, BGHS, 18th, 16-02.75; Stephen Gissenaas, SHS, 26th, 9-09.50. Triple Jump – Cory Bell, BGHS, 5th, 38-07; Kyle Horner, BGHS, 10th, 36-04. Discus – Ben Walker, BGHS, 1st, 139-03; Nathan Kientzy, SHS, 9th, 109-03; Killon Burbridge, BGHS, 11th, 107-11; Michael Wright, CHS, 17th, 97-02.50; Dalton Gloe, LHS, 21st, 91-02.25; Jesse Calvert, LHS, 23rd, 80-02.75; Robert Rothbard, CHS, 26th, 72-11.25; Colton Johnstone, SHS, 29th, 69-04.75. Shot Put – Phillip Byram, BGHS, 4th, 39-11.50; Dillon Burbridge, BGHS, 5th, 39-06.25; Nathan Kientzy, SHS, 17th, 34; Caleb Cobb, CHS, 20th, 31-10.50; Dalton Gloe, LHS, 23rd, 31-04.50; Jesse Calvert, LHS, 25th, 30-08.75; Avery Hall, CHS, 31st, 24-00.50. 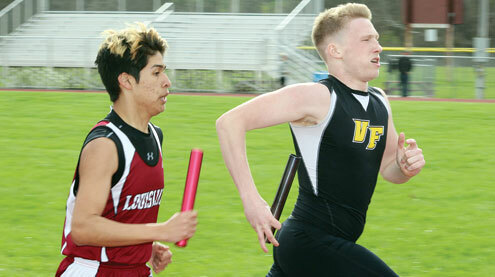 Javelin – Dalton Oberhaus, LHS, 7th, 116-01; Ben Walker, BGHS, 11th, 107; Phillip Byram, BGHS, 14th, 104-08. 4×800 Meter Relay – BGHS, 4th, 8:58.06: Avery Mudd, Jeffery Lovell, Blaine Hunt, Max Brandenburger; LHS, 12th, 10:24.24: Hunter Hobbs, Christian Medina, Tyler Pedersen, Grayson Rubino. 100 Meter Hurdles – Austin Orf, BGHS, 3rd, 17.81; Chad Bowen, LHS, 4th, 18.05; Connor Shannon, BGHS, 8th, 18.62; Avery Hall, CHS, 17th, 23.30. 100 Meter – Matthew Kay, BGHS, 2nd, 11.89; Dalton Oberhaus, LHS, 8th, 12.32; Hunter Smith, BGHS, 16th, 12.61; Colton Riley, SHS, 18th, 12.62; Robert Rothbard, CHS, 23rd, 12.89; Brandon Chatman, LHS, 26th, 13.16; Michael Wright, CHS, 28th, 13.30; Patrick Murphy, SHS, 31st, 13.58. 4×200 Relay – BGHS, 6th, 1:39.84: Lane Parker, Hunter Smith, Cale Shotton, Noah Pafford; LHS, 10th, 1:44.19: Timothy Elder, Chancey Runyib, Brandon Chatman, Dalton Oberhaus; SHS, 15th, 1:56.76: Patrick Murphy, Stephen Gissenaas, Colton Johnstone, Colton Riley. 1600 Meter – Donovan Denslow, CHS, 1st, 4:49.65; Blaine Hunt, BGHS, 4th, 5:01.98; Evan Meyer, BGHS, 11th, 5:20.27; Grayson Rubino, LHS, 23rd, 6:20.74; Michael Powers, LHS, 25th, 6:55.13. 4×100 – BGHS, 1st, 47.33: Austin Callahan, Kyle Horner, Matthew Kay, Hunter Smith; LHS, 10th, 51-04: Chancey Runyon, Brandon Chatman, Timothy Elder, Ryan Murray. 400 Meter – Noah Pafford, BGHS, 5th, 56.12; Javan Moore, BGHS, 6th, 56.45; Hunter Hobbs, LHS, 15th, 59.31; Dylan Smith, CHS, 17th, 59.79; Matthew Capstick, LHS, 27th, 1:07.62. 300 Meter Hurdles – Connor Shannon, BGHS, 3rd, 46.22; Chad Bowen, LHS, 6th, 46.85; Austin Orf, BGHS, 8th, 48.74; Patrick Murphy, SHS, 16th, 58.09; Stephen Gissenaas, SHS, 17th, 58.39. 800 Meter – Donovan Denslow, CHS, 2nd, 2:08.60; Avery Mudd, BGHS, 8th, 2:21.24; Jeffery Lovell, BGHS, 13th, 2:21.24; Christian Medina, LHS, 14th, 2:23.44; Nathan Kientzy, SHS, 21, 2:32.11; Grayson Rubino, LHS, 27th, 2:59.83. 200 Meter – Matthew Kay, BGHS, 3rd, 24.50; Javan Moore, BGHS, 9th, 25.78; Colton Riley, SHS, 12th, 26.09; Michael Wright, CHS, 17th, 27.48; Jacob Gray, LHS, 20th, 29.52. 3200 Meter – Max Brandenburger, BGHS, 8th, 11:42.81; Cody Wilkinson, BGHS, 13th, 12:04.18. 4×400 Meter Relay – BGHS, 2nd, 3:45.09: Avery Mudd, Austin Callahan, Cale Shotton, Lane Parker; LHS, 8th, 4:04.21: Brandon Chatman, Chaney Runyon, Tyler Pedersen, Hunter Hobbs. High Jump – Caleigh Grote, BGHS, 2nd, 4-10; Jaylen Early, BGHS, 3rd, 4-10; Raelee Burse, LHS, 9th, 4-08. Pole Vault- Faith Rule, LHS, 3rd, 8; Caleigh Grote, BGHS, 7th, 7-06. Long Jump – Kaya Rushin, BGHS, 8th, 14-02.50; Olivia Brune, CHS, 19th, 12-07.25; Madison Bradley, LHS, 22nd, 11-10.75; Erica Mills, CHS, 23rd, 11-10.50; Rianna Rice, SHS, 11005.25. Triple Jump – Kaya Rushin, BGHS, 3rd, 32-09; Vanessa Davis, BGHS, 10th, 29-11; Raelee Burse, LHS, 11th, 29-08.50; Caragan Lockard, CHS, 18th, 27-08; Megan Richards, CHS, 23rd, 25-04. Discus – Katelynn Charlton, BGHS, 1st, 118-11; Loni Watts, LHS, 3rd, 93-02.50; Haylee Chandler, BGHS, 11th, 79-08.75; Kate McDonald, SHS, 12th, 77-09.75; Krista Baker, SHS, 23rd, 62-08.50; Jaidyn Wommack, LHS, 25th, 56-09.75; Madison Horstmeier, CHS, 30th, 49-06.25; Olivia Brune, CHS, 32nd, 41-10.75. Shot Put – Katelynn Charlton, BGHS, 3rd, 34-08; Grace Dameron, BGHS, 4th, 33-10.50; Loni Watts, LHS, 5th, 31-05.75; Kayla Lindsay, LHS, 16th, 25-08; Emily Weatherford, SHS, 23rd, 23-10.75; Erica Mills, CHS, 29th, 20-11.25; Caitlyn Chandler, CHS, 31st, 20-08.50. Javelin – Katelynn Charlton, BGHS, 91-01; Kayla Lindsay, LHS, 11th, 79-11; Caitlin Bilhartz, BGHS, 13th, 79-08; Jamie Sencenbaugh, LHS, 19th, 68-06. 4×800 Meter – BGHS, 1st, 10:25.47: Kate Klott, Nichole Bruni, Quinn Grote, Hannah Kroencke; CHS, 8th, 12:25.04: Kari Leake, Kasey Leake, Caragan Lockard, Patricia Luke. 100 Meter Hurdles – Kamara Combs, LHS, 7th, 18.40; Kaya Rushin, BGHS, 8th, 18.72; Beverly Abel, CHS, 11th, 19.82; Megan Richards, CHS, 15th, 20.33; Jaidyn Wommack, LHS, 18th, 21.22. 100 Meter – Saige Mayfield, BGHS, 13.93; Cheyanne Talley, BGHS, 12th, 14.38; Laura Huckstep, CHS, 20th, 14.84; Chloee Kinion, SHS, 21st, 14.96; Carly Tucker, CHS, 23rd, 15.13; Hanna Blackmore, LHS, 27th, 15.75; Taylor Brown, LHS, 30th, 16.04. 4×200 Meter Relay – BGHS, 2nd, 1:55.26: Vanessa Davis, Saige Mayfield, Kinley Charlton, Caleigh Grote; LHS, 4th, 1:57.55: Raelee Burse, Emma Inglis, Faith Rule, Janel Lindsay; CHS, 9th, 2:04.82: Beverly Abel, Caragan Lockard, Carly Tucker, Olivia Brune; SHS, 13th, 2:12.24: Tessa Boles, Danitta Henson, Jordon Hurt, Chloee Kinion. 4×100 Meter Relay – BGHS, 6th, 55.67: Vanessa Davis, Cheyanne Talley, Saige Mayfield, Kinley Charlton; LHS, 7th, 55.99: Raelee Burse, Kayla Lindsay, Janel Lindsay, Faith Rule; CHS, 14th, 58.78: Olivia Brune, Laura Huckstep, Kari Leake, Patricia Luke. 400 Meter – Hannah Kroencke, BGHS, 1st, 1:04.38; Caleigh Grote, BGHS, 2nd, 1:05.63; Madison Bradley, LHS, 12th, 1:13.88; Megan Richards, CHS, 15th, 1:16.70; Kari Leake, CHS, 16th, 1:16.72; Alexis Osborne, LHS, 18th, 1:20.95. 300 Meter Hurdles – Beverly Abel, CHS, 6th, 54.29; Kamara Combs, LHS, 9th, 55.39; Kinley Charlton, BGHS, 12th, 57.24; Grace Hudson, SHS, 17th, 59.51; Cecelia Hathaway, LHS, 18th, 1:00.72. 800 Meter – Quinn Grote, BGHS, 1st, 2:35.04; Patricia Luke, CHS, 11th, 2:51.71; Madeline Perrty, BGHS, 15th, 2:55.52; Chloee Kinion, SHS, 18th, 3:02.25; Kasey Leake, CHS, 24th, 3:23.43. 200 Meter – Hannah Kroencke, BGHS, 7th, 29.58; Saige Mayfield, BGHS, 8th, 29.73; Jamie Sencenbaugh, LHS, 22nd, 32.09; Carly Tucker, CHS, 25th, 32.64; Hanna Blackmore, LHS, 26th, 34.36; Danitta Henson, SHS, 27th, 34.36. 3200 Meter – Kate Klott, BGHS, 1st, 12:08.47; Sylvia Wagner, BGHS, 4th, 13:04; Alyssa Harry, CHS, 12th, 18:00.35. 4×400 Meter Relay – BGHS, 4th, 4:41.88: Camryn Grote, Vanessa Davis, Quinn Grote, Madeline Perry; CHS, 8th, 4:53.36: Beverly Abel, Patricia Luke, Caragan Lockard, Megan Richards; LHS, 11th, 5:25.38: Hanna Blackmore, Madison Bradley, Alexis Osborne, Cecelia Hathaway.